Introduction: Acute pancreatitis can develop from gallstones obstructing the cystic duct or from alcohol intake. It can also rarely form secondary to other causes such as medications or metabolic problems. As a result of this a pacreatic pseudocyst can form, this can resolve spontaneously or may require intervention. When intervention is required there is a risk of developement of an infected pancreatic pseudocyst which can be very dificult to manage. We present a case of a 30 y/o male with acute pancreatitis secondary to alcohol intake who developed a pancreatic pseudocyst. He underwent endoscopic stent placement beetween the cyst and the stomach. Afterwards he developed an infected pancreatic pseudocyst. The patient developed oral intolerance and fevers and elevated white count.He was kept NPO and received IV antibiotics. A decision to intervene in conjunction with gastroenterology was made and the patient underwent a transluminal endoscopic pancreatic debridement and cyst gastrostomy creation. A wide opening was perfomed. The patient was discharged home with improved symptoms. On his clinic follow up he had improved, he was asymtomatic and was able to tolerate oral diet. 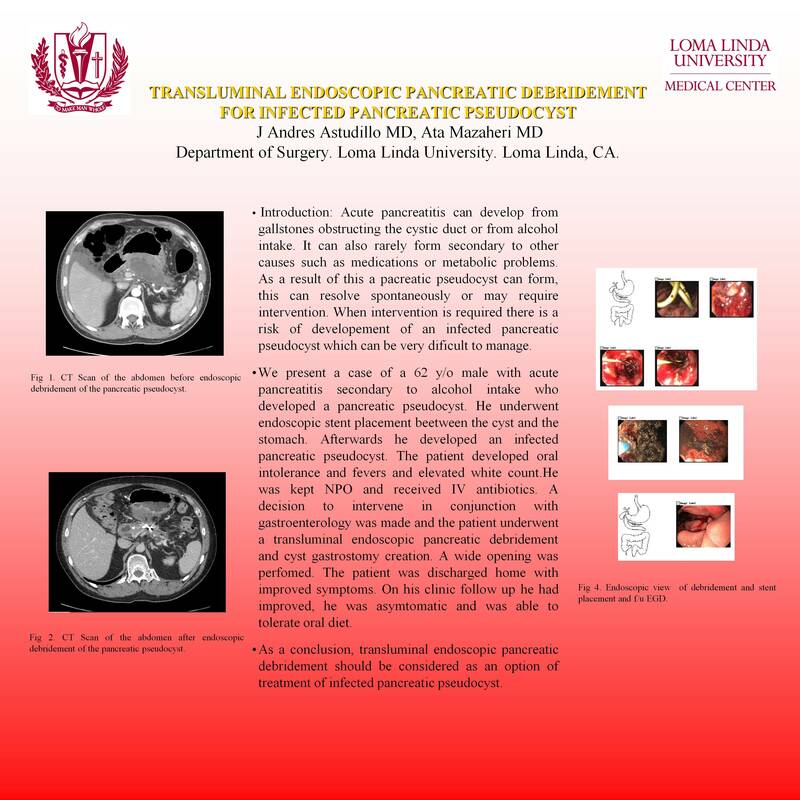 As a conclusion, transluminal endoscopic pancreatic debridement should be considered as an option of treatment of infected pancreatic pseudocyst.